Brimming with a lefty boomer’s indignation, Robert Redford’s state-of-the-nation address shoots arrows at a number of targets: Republican snake-oil salesmen, the apathetic public that underwrites their transgressions and a media that simply cowers in the corner. We drop in on a tête-à-tête between a senator (Cruise) and the journalist (Streep) reporting on a sound-bite–friendly initiative to curb alleged Iranian aggression in the Middle East. (“Has this been confirmed?” she asks. “By their denials,” he instantly replies.) Cut to a professor (Redford) rhapsodizing about two former students serving in the military. Meanwhile, in Afghanistan, those aforementioned soldiers (Peña, Luke) become pawns in the same gung ho PR campaign concocted by the Capitol Hill hotshot. Are you mad as hell yet? The fact that Lions for Lambs brings up questions about complicity and the selling of war—something most issue-driven dramas still won’t go near—is commendable. But casting Cruise as the embodiment of superficial spin is downright ingenious: Who better to play a Teflon politician than a Teflon movie star? 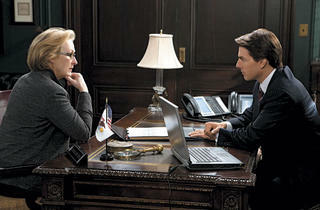 Like Milton’s Satan, Cruise’s character gets the best lines in screenwriter Matthew Michael Carnahan’s torn-from-the-CNN-ticker screed, while Streep’s guilt-ridden pundit and Redford’s academic caricature are left to play two-dimensional mouthpieces. Statistics get thrown around willy-nilly; quixotic jabs at those who build big bombs and hide behind desks are right around every corner. Well-intentioned, overwritten polemics like this haven’t been seen since Rod Serling’s heyday, and the immediacy of the movie’s message is undercut by the musty quaintness of its muckraking. What decade is this again?